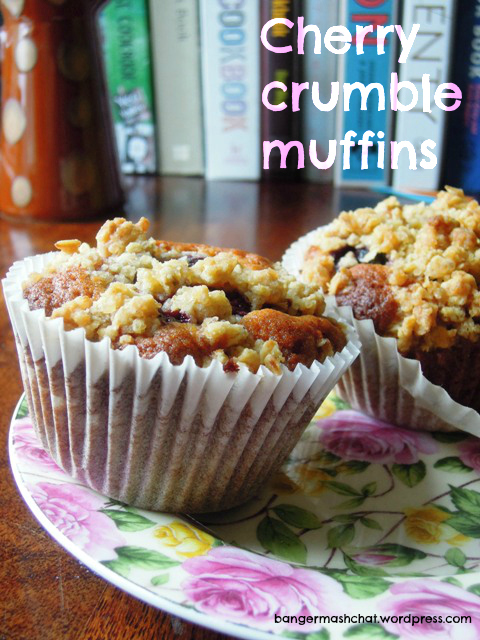 We often make apple crumble muffins in our house. They’re a lovely cross between a cake and a pudding and popular with children and grown ups alike. The other day I thought I’d see what they were like using cherries instead of apples. I was inspired by my friend Sarah who baked us the most gorgeous cherry crumble when we went over to hers recently. I thought the apple crumble muffins were good, but boy! These cherry bad boys are to die for – I’m totally addicted! Preheat oven to 190°C (375°F) Gas 5. To make the topping, cut the butter into small pieces and put in a mixing bowl with the Demerara sugar, flour and oats. Work them together using your finger tips until it looks like crumble mixture. For the cake mixture, sieve the flour and baking powder into a mixing bowl and mix in the sugar. Make a well in the middle, pour in the melted butter, beaten eggs and honey and mix gently. Spoon the mixture into paper muffin cases in a 12-hole muffin tray. 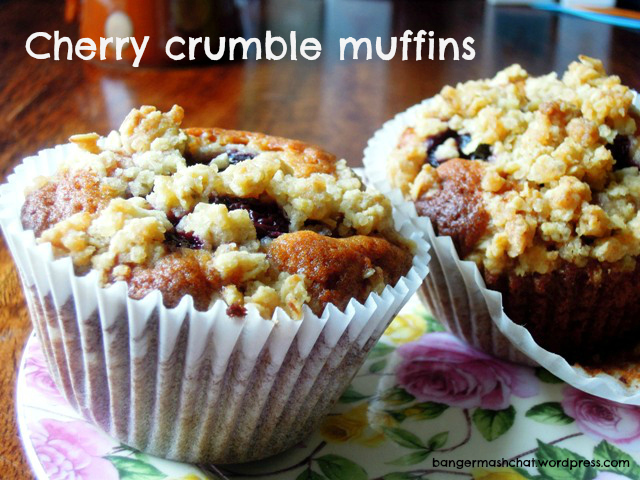 Place four cherries on top of each muffin and then carefully sprinkle over the crumble topping. Bake for 25 to 30 minutes until golden brown. Just perfect for a mid afternoon snack. 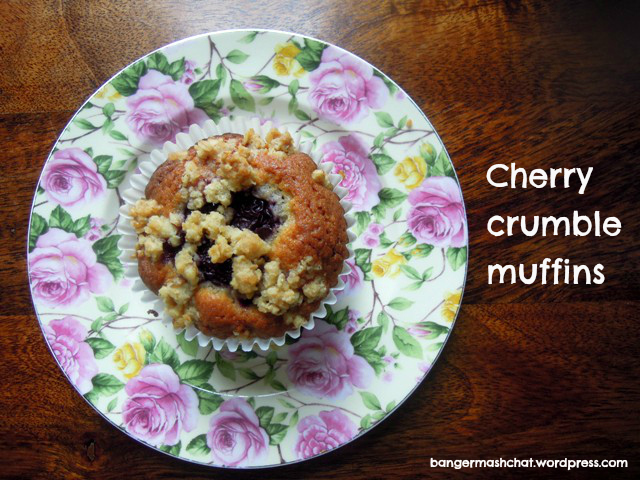 As these scrummy muffins contain oats and honey, and cherries are almost berries (yes, I know they can’t be a berry because they have a stone rather than seeds), I’m entering them into this month’s Recipes for Life challenge. And since I’m hosting it, I’m going to allow cherries in as a wannabe-berry. So there. Sticklers for the rules can swap their cherries for blueberries or blackberries I suppose. You’ve just sorted out our activities for Friday – a walk to the market to buy cherries, then home to make muffins – thank you! I am on a muffin roll at the moment so this recipe is very handy. Ooh, what lovely muffins! I’m bookmarking the recipe for when cherry season rolls around here. Delicious. I love muffins! I didn’t try them with cherries yet 🙂 Thanks for the recipe! You’re very welcome, Sylvia! Let me know what you think of them if you do ever bake them. Thanks Tandy! And how lovely to see you here. It was so good of Jac to mention me in her #FBC5 post recently! 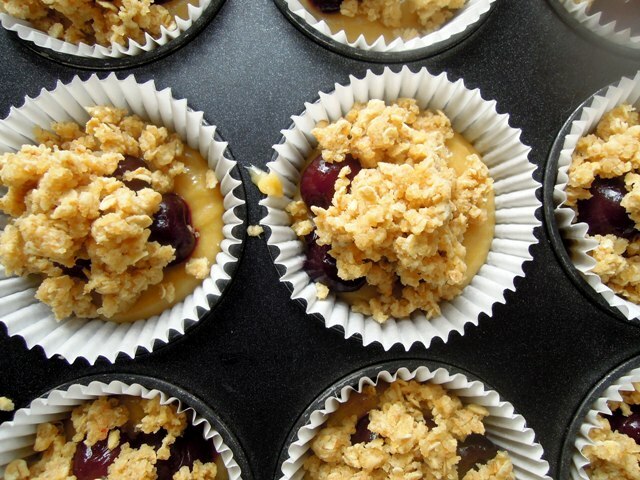 These look delicious – I have some cherries and was thinking we needed to bake something today….. Thanks Anna – do come back and let me know what you think of them if you do bake them, won’t you?